Ford — A Generous Gift Indeed! October 18 Work day at the Graffiti House and on the Battlefield 9 AM until ? Charcoal drawings and signatures cover the walls inside the Graffiti House, buried under layers of paint. But that is not the only evidence of the Civil War buried in Brandy Station. Boy Scout Scott Johnston, 13, uncovered a bronze Union Army belt buckle last month while working on his brother Glenn’s Eagle Scout project. The project comprised 15 members of Troop 198 installing a drainage pipe along the road outside the Graffiti House. Bob Luddy, president of the Brandy Station Foundation, said an artifacts collector confirmed the Union buckle to be from 1851 — 12 years before the Battle of Brandy Station. The buckle is actually a sword/belt plate, used to hold a soldier’s belt as well as suspend his sword. “To find a piece like that,” Luddy said, “it’s priceless with its historical value. But with the state of its condition, it could easily be worth $400. It’s a really nice find." Along with the buckle, Scott and others found a small green glass gin bottle and pieces of a ceramic plate. He was able to determine the buckle was from the Civil War because of the eagle, 13 arrows and 13 leaves pictured — symbols similar to the ones on the $1 bill he learned about in class at Epiphany Catholic School. “I wanted to keep it,” Scott said, but instead opted to turn it over to the BSF. The buckle sits in a glass display case inside the Graffiti House, alongside a handful of reproductions. Scott and Glenn, 17, who will attend Catholic University this fall, beamed as they showed off their finds. Glenn goes before the Boy Scouts’ Board of Review tonight to determine whether he will get his Eagle Scout badge. 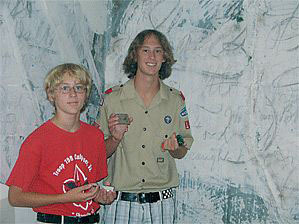 Scott Johnston, left, and his brother, Glenn, display their finds inside the Graffiti House. Scott uncovered a Union Army belt buckle last month, which an artifacts’ collector verified as a genuine Civil War piece. 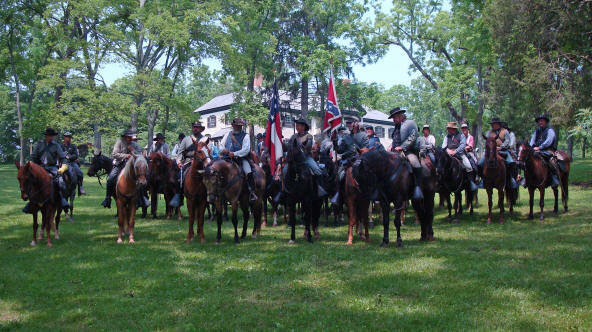 Approximately one hundred people gathered to celebrate the 145th anniversary of the Battle of Brandy Station at an Historic Ball on June 7, 2008 at the Inn at Kelly’s Ford. 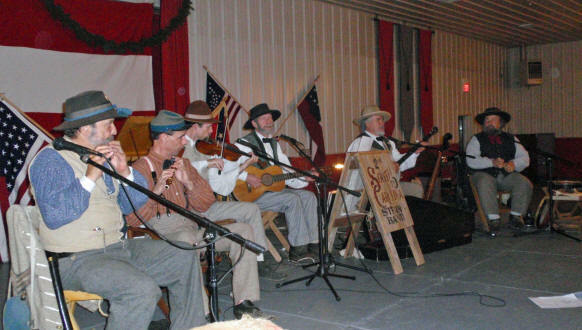 The 2nd South Carolina String Band played music from the Civil War Era with Dance Masters guiding guests through waltzes, polkas, the Virginia Reel and other dances of the period. A delicious dinner was provided by the Inn. The BSF is forever appreciative of the outstanding support given to the foundation by the generous and charming Linda & Bill Willoughby, owners of the Inn at Kelly’s Ford and long-time friends of the Foundation. Our thanks also go to Clark B. “Bud” Hall for graciously filling the job of Emcee of the evening as well as his excellent ability as the event’s auctioneer. Attendees enjoyed a silent as well as a live auction and the Board of Directors of the Foundation is very grateful for the many and varied donations that made up the auction. The tireless chairs of the event, Ms. Jane Brookins, Mrs. Helen Geisler, and Ms. Peggy Misch, extend their thanks to the volunteers without whom an event like this would not come off. A special surprise of the evening was the appearance of the battle re enactors in their full Civil War era regalia and accompanied by their charming ladies in their period evening gowns. Col. Darrell Markijohn, USV, and Col. Joe Ferguson, CSA, delighted the crowd by presenting President Bob Luddy with a check from the Union forces for $1000 and the Confederates made a pledge to the BSF in the same amount. These funds were given for the express purpose of aiding in historic land purchase and preservation. The re enactment community and the BSF delight in supporting each other in our united goals of honoring and preserving our history. It was a wonderful evening in support of the Foundation and its continued goals of preservation of the Brandy Station battlefield and restoration of the historic Graffiti House. 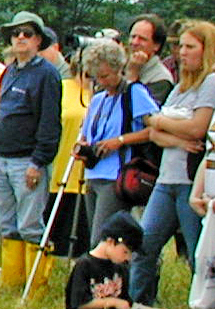 Deborah (center looking at camera) standing in the rain during the 140th Anniversary activities on the Brandy Station Battlefield. Deborah Fitts passed from this world on July 26, 2008. She was a remarkable person. She was born into a distinguished New England family, accomplished professional achievement with the Civil War Times and the Civil War Trust, shared a loving life with her husband Bud Hall and was a friend to many within the Civil War community. Many of us knew her through her many year association with the Civil War Times. We could always count on Deb’s diligence in following a story, her rooting out of details from the most unlikely locations, her courage in refusing to back down in the pursuit of the truth, and her ability to write the story in terms that were simple, direct, and understandable. I tried to find some pictures of Deb during those times when she was with us at Brandy Station events but had little success – and then I realized why. The pictures I had on file were of the event and Deborah had scrupulously tried not to be part of the event – she was there to record the story not to be the story! This past June, over 200 Union and Confederate re-enactors from up and down the eastern seaboard and the Midwest descended upon the very fields soldiers fought over and camped on 145 years ago. Today’s soldiers were invited to camp and fight on the Brandy Station battlefield by the Civil War Preservation Trust, who owns the land. The Federal forces were led by Colonel Darrell Markjohn and the Rebels were under the command of Colonel Joe Ferguson. 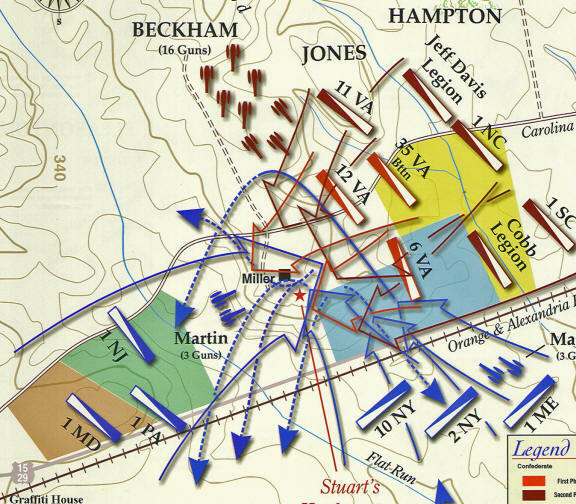 Conditions were not unlike events of June 1863; hot, muggy and hazy but the Federals passed over both the Rappahannock and Hazel Rivers and were entertained and briefed by leading Civil War historian Bud Hall at Presque Isle, a private residence on the Little Fork. Later, Mr. Hall met with the Confederates at Farley, headquarters to both sides during the conflict. A mounted ride to the Buford’s Knoll area of the battlefield was made ,where Mr. Hall spoke of the fighting on that spot. Bud not only talked of the momentous events of June 1863, but also of the fighting that took place in the 1980s and 1990’s as the CWPT and BSF successfully fought to preserve the land we have today. Many of the re-enactor leadership journeyed to the Inn at Kelly’s Ford and participated in the Ball held there by the Brandy Station Foundation. Let it be noted here that is now less than five years until the 150th anniversary! The Brandy Station Foundation looks forward to a fitting commemoration of this milestone and hopes to join with the re enactors and the whole of the community of Culpeper and more in honoring the remembrance of the four years of internal conflict fought over the very. lands that we strive today to preserve for future generations to appreciate and understand. 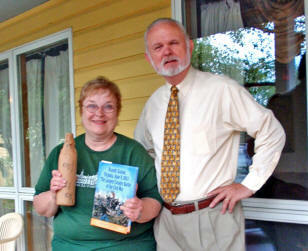 Bob Luddy, BSF President, presenting Donna Crone , Program Chairman of the Susquehanna CWRT, with a copy of Joe McKinney’s book (Brandy Station, Virginia June 9, 1863; the largest Cavalry battle of the Civil War) and a bottle of Graffiti House wine. Outreach activities continued at a brisk pace this quarter. Talks were given and information exchanged with the Anne Arundel Maryland Civil War Round Table (CWRT), the Susquehanna, Pennsylvania CWRT and the Maryland Artifact Recovery Society of Lithicum Heights, Maryland. Subjects presented included the Battle of Brandy Station, the Graffiti House and the Winter Encampment. Our members and volunteers enjoyed hosting and educating the children of the 'Summer Day Camp Culley' put on by the Museum of Culpeper History. It was a delight to have them at the GH. The Foundation has also been busy this summer in supporting the Brandy Station Volunteer Fire Department Carnival and the Bluemont Concert Series. Have you seen the new Graffiti House Signs? Five new signs point the way to the Graffiti House. Two are located on Route 29, one on Alanthus Road and two are on Brandy Road. These now show the Graffiti House on the Civil War Trail signs and maps. Della Edrington worked on this project for three years! Graffiti House Volunteer, Clint Robertson, was recently recognized for his production of an outstanding video for the Brandy Station Foundation. Clint was given a Silver Award at the 29th Annual Telly Awards in the 'Not-for-Profit' category for his video about the Graffiti Exposure and Preservation Assessment that was conducted at the house in July of 2007. The following volunteers qualified for the Presidential Service Award: Bronze: Robert Pfile, Shirley Pfile, Mike Block, Barry Atchison and Peggy Misch. And Gold: Robert Luddy and Della Edrington. 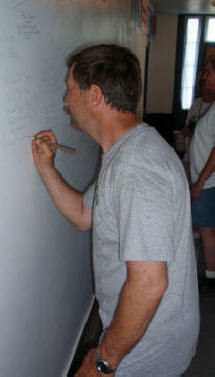 People continue to come by the Graffiti House to sign the Wall of Honor. Most recent visitors include Frank Markham signing for William Markham of the 9th New York Cavalry, Darrell Griffiths and his grand-son Tyler Costa signing for John Woll of the 4th US Battery, Mark Dempsey signing for John Dempsey of the 2nd New York Cavalry, and Virginia Clay Pannill for J.E.B. Stuart. The land saved by the CWPT is shown on the right (east) side of the map and consists of two parcels totaling 49 acres. This land, in concert with the 33 acres (far left of map) previously saved by the BSF gives the forces of battlefield preservation most of both east and west slopes of Fleetwood Hill and over 82 acres of land. Your donations and dedication have made both the BSF and CWPT land purchases possible. You have succeeded in the preservation of America’s history and should take a deep bow! On October 18th, volunteers of the BSF will be working around the Graffiti House to prepare the house for the winter and clearing trails on the battlefield. If you can lend a helping hand, please meet at the Graffiti House, 19484 Brandy Road, in Brandy Station at 9AM. Bring gloves, chainsaws, clippers and your interest to help preserve Culpeper’s history. On March 25, 2009 (yes next spring), Fauquier County will be hosting a Civil War Symposium. The lectures will be centered on the twelve primary engagements which took place in or through Fauquier County. The Keynote speaker is scheduled to be Robert Krick, retired Chief Historian, Fredericksburg and Spotsylvania National Military Park. Mr. Krick is the author of numerous books and articles and is a member of many boards such as Civil War Preservation Trust and the Central Virginia Battlefield Association. The Brandy Station Foundation was the recent beneficiary of a generous gift from Greg Hebler as part of the 150th Birthday celebration for the Graffiti House. Mr. Hebler donated to the Graffiti House his collection of pictures taken of the Graffiti House in the 1993-4 time period. The pictures show desolation in the extreme and make even more meaningful the actions that Mr. Hebler took to save the building at that time. Thanks Greg for your generous gift of the pictures and your actions to save the building. At right is one of the pictures showing the condition of the room. The Lake of the Woods Wilderness 'Tiques Antique Club was awarded a $2,000 grant from the International Questers Club to be used towards purchasing antique furnishings for the Civil War Graffiti House in Brandy Station. Funds from the grant will be used to recreate a setting within the house depicting the use of the building as an administrative office during the Union army’s 1863-64 winter encampment. The club will be coordinating with Graffiti House volunteer, Della Edrington, as well as Sarah Hayes - the owner of the Quail at the Wood Antique Shop – to purchase a writing desk, a table to hold the desk and a chair. All items will be circa 1863. 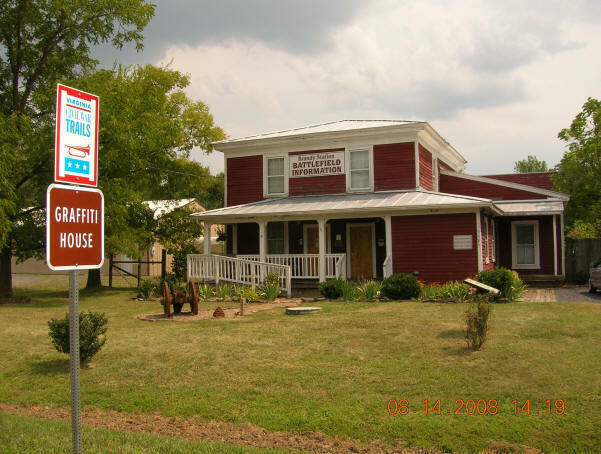 In conjunction with the Brandy Station Foundation, the LOW 'Tiques will be holding an antique appraisal show with 4 professional appraisers on Nov. 8, 2008 (10AM to 2PM) at the Graffiti House with all profits going toward the restoration of the house. Verbal appraisals will cost $10 each or $25 for three. Bob & Shirley Pfile will be hosting this event. The Wilderness 'Tiques is one of 900 chapters of Questers International and the purpose of the club is to study antiques and donate funds to the preservation of existing historical buildings. The Brandy Station Foundation (Della Edrington), Museum of Culpeper History (Lee Langston Harrison) and the Culpeper Department of Tourism (Beth Burns) have been awarded a grant from the Virginia Tourism Corporation to lay the foundation for locally generated tourism. The three partners have developed “Think Locally”, a campaign to introduce the public to the Culpeper region. A key component of this activity will be the development of an audio tour. This tour will be available on CD, allowing visitors to tour downtown Culpeper and the Civil War battlefields at their own pace. BSF volunteer Joe McKinney is writing the script for the 3 major battle engagements in Culpeper for the audio tour. In 2007, BSF was awarded a grant from the Commonwealth of Virginia, Department of Historic Resources. A portion of this grant was spent last year when Paint Conservator, Kirsten Travers, investigated a variety of paint removal methods at the Graffiti House. This spring, an Architectural Report was completed by the firm of Dalgliesh, Gilpin, Paxton Architects of Charlottesville, Virginia. The purpose of the Architectural Report was to review existing conditions and to recommend restoration, rehabilitation, and interpretation strategies for the structure. Restoration was defined as bringing a building or portion of the building to its original appearance through the use of recreating existing or removed finished and architectural elements. Rehabilitation, on the other hand, would include alternate materials and design concepts to modify the original structure to meet a 21st Century “lifestyle”. FOUNDATION: The building’s foundations appear to have originally consisted of individual stacked stone piers spaced around the building perimeter with some interior piers spaced along interior beam lines. Evidence of movements, settlement and rotation of the existing exterior foundations walls and piers were observed. One option for remediation of the foundations is to remove and replace the piers with new concrete footings and walls. EXTERIOR SIDING: Weatherboards are to be carefully removed and numbered. An inspection of the plaster keys is necessary and shall be conducted at this time. An application of felt paper to the studs will be attached. Flashing detail for windows and doors will be applied. All weatherboards will be secured with stainless steel screws. Weatherboards needing replacement will match existing. FRAMING: The computed live load capacities in the Interpretive Area and Media Room are below building code requirements. On the upper floor, significant sagging was noted. As a temporary measure, it was recommended that install wood beam and post supports below the existing floor joists in these areas. MECHANICAL SYSTEM: The existing un-insulated building is heated with a combination of wall mounted propane heaters and electric baseboard heaters. Air conditioning is supplied by window units. One option would be to provide a split system heat pump with electric resistance auxiliary heat for cooling and heating. Given the sensitive nature and historic value of the property, we recommend that only contractors experienced in historic structure renovations and stabilization should be considered for any type of work on this building. Contact Della Edrington at graffitihouse@brandystationfoundation.com or 540-825-4543 for more information about this report. Donations for the Graffiti House preservation and restoration project will be gratefully received at P.O. Box 165, Brandy Station, VA 22714-0165. Civil War living historians, this time from the 49th Virginia Infantry Regiment “Billy Smith’s own” set up camp at the Graffiti House on July 20 as part of the Brandy Station Foundation’s living history series. Two dozen men, women and children were at the Graffiti House for a day to give visitors a taste of what is was like for both the Confederate soldiers and their families as the war progressed. While having men and women in camp was not uncommon, what made this visit different was that many of the women, young and old, were in mourning garb. The Civil War caused hundreds of thousands of casualties, not all due to combat, and it was left to the women to show the suffering. The women of the 49th presented a scene often forgotten during this conflict, the home front. It was a unique opportunity to speak with these re-enactors as they portrayed grieving family members. All was not sad during the day, as there were firing and cooking demonstrations as well as an opportunity for the house visitors to visit with and learn from this fine group from Fauquier County and Northern Virginia. Our living history weekends are not over. On September 13 and 14, Sykes Regulars from the Army of the Potomac’s Fifth Corps will be at the Graffiti House and on October 17 and 18, the Orange Blossoms, better known as the 124th New York will set up camp in Brandy Station. Reservations are not required. Donations to the Brandy Station Foundation are welcomed. Free refreshments will be served. October 26 – "Recovering the Remains of Capt. Farley – An Archeological Perspective." Dale Brown will describe the process of exhuming Captain Will Farley’s remains from the Fairview Cemetery that were reinterred in Laurens, SC, his home. Farley was one of JEB Stuart’s key scouts.